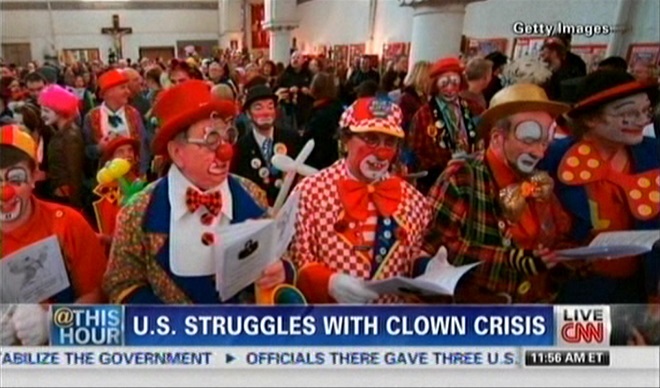 Serious news on CNN: the United States is suffering from a clown crisis. Being a clown is just not cool anymore, and the number of clowns is dwindling. Some areas may soon be altogether without clowns unless these alarming trends get reversed. CNN did mention that there may be an ample supply of qualified clowns right there in Washington, in the form of the U.S. Congress. In the same vein, when my wife saw the images from some U.S. clown convention, she wondered aloud if these might in fact be pictures from a Tea Party gathering. Who knows. Or perhaps the clown shortage is simply due to the fact that many of them found a more lucrative profession: manufacturing telescopes with concave lenses. The Swiss are a proud people. Their country has been peaceful and prosperous since Napoleonic times. Several years ago, when I was in Bern, Switzerland, streetcars bore German-language signs advertising 200 years of safety and security. This was made possible, in part, by a strong and effective defense force, which would make any invasion too costly for a would-be attacker. Or so I thought. Until yesterday, that is, when in the wake of the recent hijacking of an Ethiopian airliner, which eventually landed in Switzerland, the CBC helpfully explained the reason why the airliner was escorted by French and Italian fighter jets. 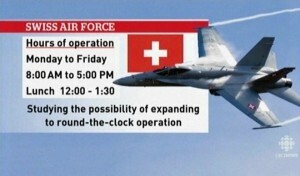 You see, the Swiss Air Force operates only during normal business hours. Invading armies should take note: Switzerland is closed after 5 PM, so if you are late, you might want to reschedule your invasion plans for the next business day. I don’t normally comment on crank science that finds its way into my Inbox, but this morning I got a really good laugh. What’s that, you ask? 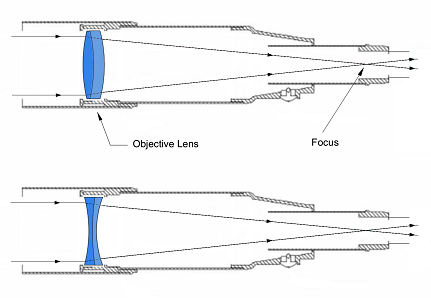 Why, a telescope with a concave lens. Had I paid a little bit more attention to the e-mail, I might have been a little less surprised; they did include a longer title, you see, helpfully typeset in all caps, which read, “APPARENT DETECTION OF ANTIMATTER GALAXIES VIA SANTILLI’S TELESCOPE WITH CONCAVE LENSES”. Say what? Concave lenses? Why, it’s only logical. If light from an ordinary galaxy is focused by a convex lens, then surely, light from an antimatter galaxy will be focused by a concave lens. This puts this Santilli fellow in the same league as Galileo; like his counterpart five centuries ago, Santilli also invented his own telescope. But wait, Santilli is also a modern-day Newton: like Newton, he invented a whole new branch of mathematics, which he calls “isodual mathematics”. Certainly sounds impressive. So what does Einstein’s relativity have to say about all this? Why, it’s all a “century of scientific scams by organized interests on Einstein […] to discredit opposing views”. It’s all “sheer dishonesty and scientific gangsterism”. But it is possible “for the United Stated of America to regain a minimum of international scientific credibility”. All that is needed is to “investigate the legality of the current use of public funds by the Department of Energy and the National Science Foundation on research based on the current mandate of compatibility with Einstein’s theory” and the US of A will cease to be bankrupt. Oh, and you also need some telescopes with concave lenses. One of the many victims of fascism in Hungary was the poet Miklós Radnóti, murdered in November 1944 while serving in a forced labor battalion. Radnóti’s wife, Fanni Gyarmati, survived the Holocaust and continued a quiet life in Budapest, in the couple’s old apartment, which bears the name of Dr. Miklós Radnóti on its front door to this day. 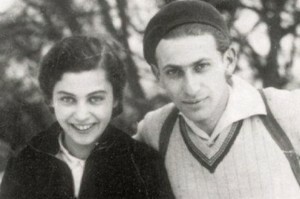 Astonishingly, Fanni Gyarmati lived for another 70 years following her husband’s tragic death. She passed away today, at the age of 101. May she rest in peace. May those who were responsible for her husband’s death never find peace. Nor those who are busy whitewashing Hungary’s history as racism and anti-Semitism are once again on the rise in the country of my birth. China’s first rover on the Moon (and only the seventh rover in the history of space exploration) may be alive. The concern was that two weeks ago, as the robot was about to retire for the lunar night, it did not properly process commands that were supposed to place it in a night configuration to prevent critical systems from freezing up. It was quite possible that we would never hear from the robot again. 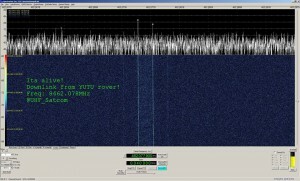 But here it is… a signal, strong and loud. I guess in the coming days, the Chinese will reveal what, if any, damage the rover suffered during the long, cold lunar night. 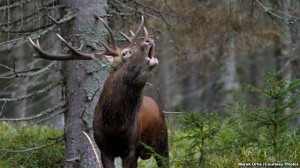 According to Radio Free Europe, there are some remarkably law-abiding deer living along the one-time Cold War border between the former West Germany and Czechoslovakia. The border (barbed wire, complete with electric fences, heavily armed guards, watchtowers and whatnot) is long gone. Yet the deer are still reluctant to cross, and this behavior is passed on from one generation to the next. Remarkable. I am sure it would meet the approval of those comrades who came up with the idea in the first place that the primary purpose of a nation’s borders is not to keep enemies out, but to keep their own reluctant citizens confined inside.